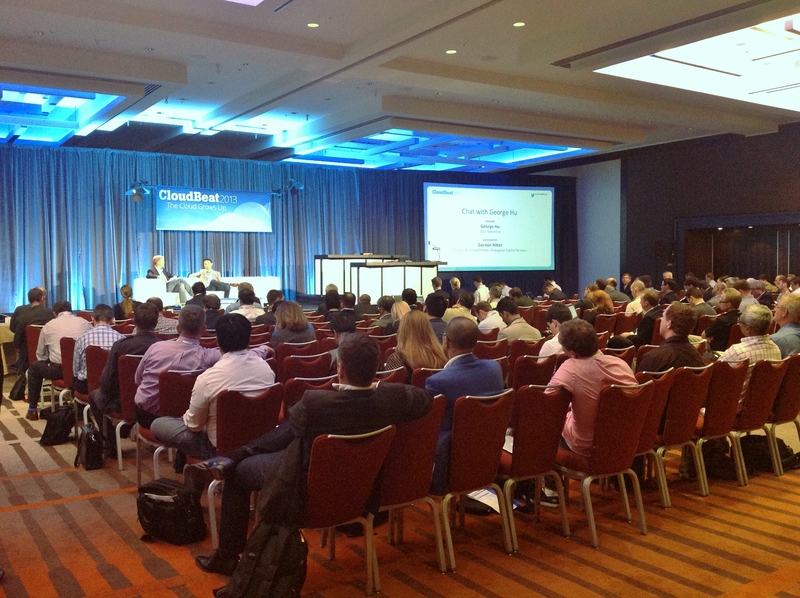 Now in its third year, VentureBeat’s CloudBeat September conference in San Francisco consists of discussions, case studies, breakout sessions, and announcements reflecting the growing maturity of the cloud. From what I could tell (from the profiles displayed by the innovative Bizzabo iPhone app. that facilitates networking at the event), the 100+ audience at CloudBeat consisted of entrepreneurs, investors, CEOs and CTOs, as well as business development, sales and marketing VPs/directors. This conference has an unusual and interesting format that consists of on-stage interviews. Unlike most conferences, the speakers do not present the corporate slide deck. They are interviewed on stage by a knowledgeable host, they answer questions and tell related stories. For example, Ilya Fushman, Dropbox’s head of products for business and mobile, talked with analyst, Paul Miller, about going beyond storage for 10 million users and 2 million businesses to become a platform for application developers. 3Scale, Accel Partners, Adobe, Alchemist Accelerator, AppDynamics, Artisan Infrastructure, AT&T, Axxess Unlimited, Bessemer Venture Partners, Box, Braintree, Canvas, Cisco’s Collaboration Technology Group, CITEworld, Citrix Systems, Cloud Foundry, Cloudability, Cloudant, CloudImmunity, CloudPassage, CloudPulse Strategies, Cloudscaling, Dark Matter Labs, Data Collective Venture Capital, Define the Cloud, Dell, Disney, Diversity Limited, Dropbox, Edmunds.com, Egnyte, Elance, Emergence Capital Partners, Engine Yard, Epignosis, Eucalyptus Systems, Firebase, Foley & Lardner LLP, GGV Capital, GlobalLogic, Harshman Phillips & Company, Hillenby, HP, IBM, Industry commentator, consultant & investor, Internet2, Issac RothShasta Ventures, Jive, Joyent, LED Source, LinkedIn, Metamarkets, Microsoft, MuleSoft, Nebula, Netflix, Norwest Venture Partners, Numecent, Okta, Optimizely, Parallels, Parsons, PayPal, Pivotal, ProgrammableWeb, Red Hat, Relevance, Room Key, Salesforce, Sanmina, SAP Ventures, Scale Venture Partners, Scribe Software, SendGrid, Inc., Silicon Valley Bank, Simple Signal, SimTable, SoftLayer, Spoke Software, SwiftStack, Symantec, Totango, Twilio, Vidyo, Wanelo, Xero, and Xerox PARC. The event sponsors had tabletop displays outside the main room. 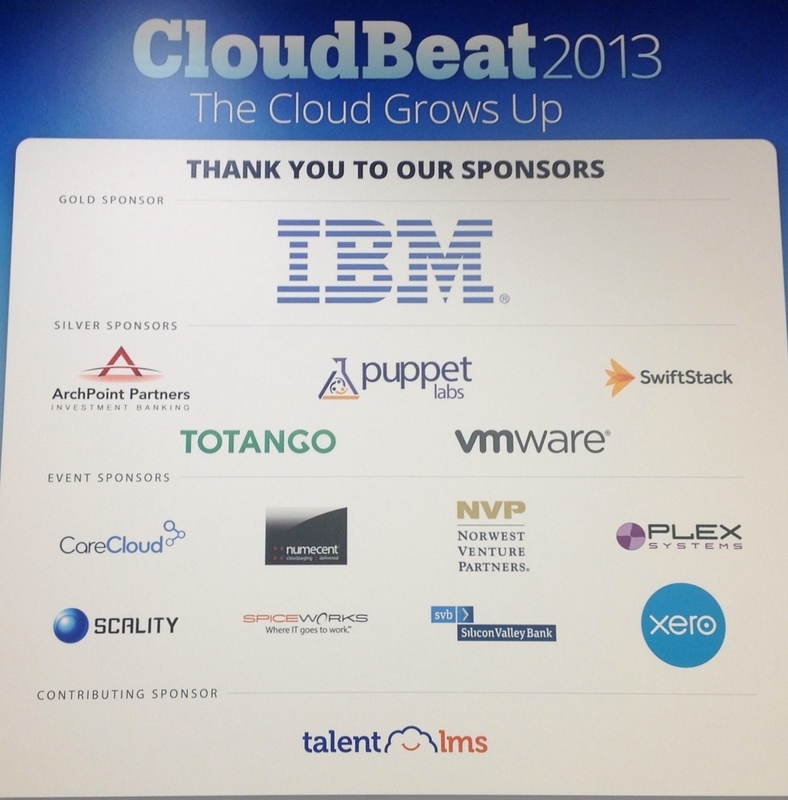 I’m not sure the cloud-related vendors expected to generate many sales leads from this event. In at least one case, the vendor was there because it was a local event and one of their marquee customers was a speaker. Having a name-brand customer talk about how they use your cloud product is a good enough reason for a local upstart-up to sign up, especially when the interviews are recorded. 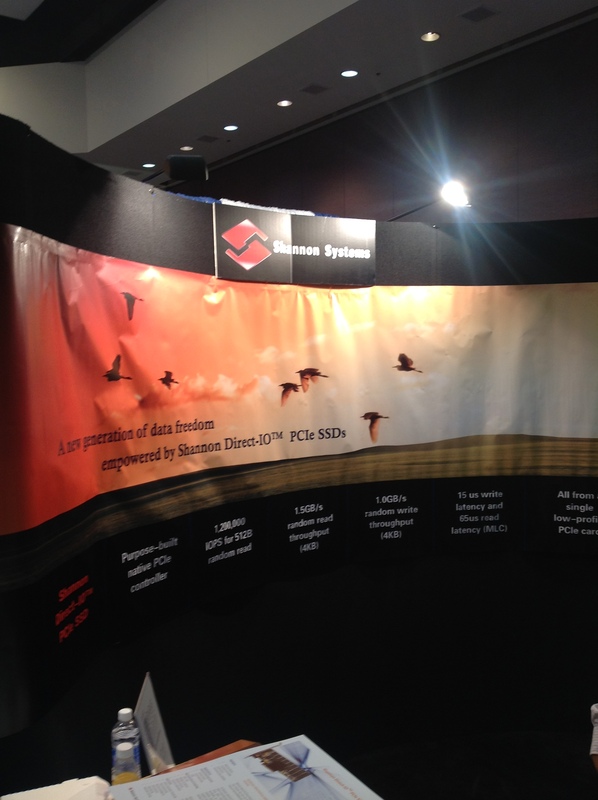 Interesting storage and security vendors included KeyNexus, Scality, and SwiftStack. Scality and SwiftStack provide highly-scalable, software defined, storage solutions to larger organizations. These are object storage systems based on the OpenStack framework. The software takes advantage of commodity servers and hard drives. Rather than use a SAN or NAS for storage these systems pool the storage in each server and make it available in the cloud. Unlike NAS and SAN, the number of processors and network controllers scales alongside the storage allowing the system to support a very high volume of concurrent users. The software then centrally manages data protection (replication) and performance (caching using server-based RAM or Flash). Cool stuff! KeyNexus launched their cloud-based encryption-key storage and management solution for Amazon Web Services (AWS EC2) at CloudBeat. KeyNexus enables organizations to store, manage, and audit their encryption keys separately from the cloud, addressing the principal inhibitor to broader, faster, adoption of the cloud by enterprises — security! Here’s how they describe it. There are three typical cloud security scenarios. First, the key to unlock encrypted data is stored in the same cloud as the data. That’s like locking your house but leaving the key in the lock. In the second scenario, companies employ vendor solutions that host the key in an undisclosed location. That’s like having to call a security guard to access your home and unlock the door (and trusting the security guard never goes in when you are away). Option three involves securing the key on-site within the enterprise, which can be costly. The KeyNexus approach separates the “lock” from the “key” in the cloud, while also promoting encryption interoperability across the public cloud. Using a hardware appliance to create the keys, KeyNexus simplifies the management of remote key rotation as well as the migration of encrypted data between various cloud, SaaS and mobile platforms. 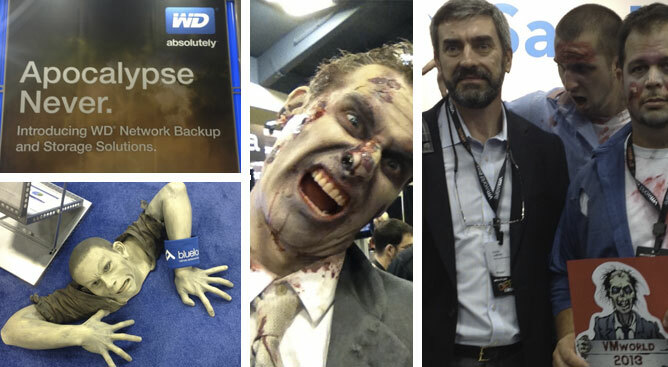 The VMworld 2013 expo was all about storage, cloud (storage) and securing the data (on the storage). I wouldn’t be surprised if a trade show analyst declared this to be the enterprise storage event of the year and a preferred alternative to Storage Networking World (SNW). I’ll expect the same next year because the vendors I spoke with told me it was a good event for them. They said they met more end-users this year and most have exhibited for many years. All in all it was a great event, but by the time I hit the expo the booth babes were looking a little rough. WD says “Apocalypse Never” but they were clearly wrong. This event had more than it’s share of zombies thanks to Bluelock, Sandbox and one other vendor (who deserves credit…help!). I checked in with the storage-related vendors: Aberdeen, Asigra, Avere, Bluelock, Cloudbyte, Cloudfounders, Codefourtytwo, Commvault, Coraid, Dell, EMC, FalconStor, Fusion-io, Greenbytes, HDS, HP, Maginatics, Maxta, Micron, Nasuni, NetApp, Neverfail, Nexsan, Nexenta, Nimbus Data, Nutanix, Permixdata, Pure Storage, Qnap, Quantum, Racemi, Scality, Simplivity, sTec, Synology, Tegile, Tintri, Violin Memory, Virident, VirtunetSystems, WD, X-IO, Yuruware, Zadara, as well as other neat firms like Brocade, Cognizant, Rapid7, Sandbox, Splunk, Thinking Software and others. From a marketing perspective it was clear that almost all the vendors had innovative products and if you gave the salespeople a chance they could articulate what makes their particular product special. Frankly, it was important to give them a chance to talk because many booths failed to adequately communicate to passers by what their company was selling, let alone what made their particular product special. It’s easy for marketers to assume that everyone else knows as much as they do about their offering. However, they assume too much. I can name 75+ Vendors Promoting an Enterprise Solution that Uses Flash Memory — that list excludes standard HDD-based storage, and most of the software solutions, including a gazillion backup/recovery products. There are easily 200+ firms vying for the attention of enterprise storage managers, analysts and journalists. Nimbus Data was clear. They were showing “The most resilient, future-proof flash memory storage ever.” And, it must be fast to set records. Nimbus Data: An example of clear messaging. Coraid’s value proposition was not immediately clear to me from their signage. However, when you talk with Coraid you can learn that their storage uses ATA over Ethernet, rather than iSCSI, Fibre Channel or Infiniband. I haven’t checked the specs., but they told me it was faster than iSCSI and Fibre Channel, it offers parallel performance, and it’s not limited by cable length. I’m sure storage buyers can see the value in that, especially if the price is right and they are open to another interconnect standard. Software-as-a-Service (SaaS) and Infrastructure-as-a-Service (Iaas) pricing models helped differentiate some products. Bluelock offers recovery as a service where they continuously backup data to the cloud and enable failover to the cloud if an issue takes down the primary data center. Asigra also offers recovery as a service. 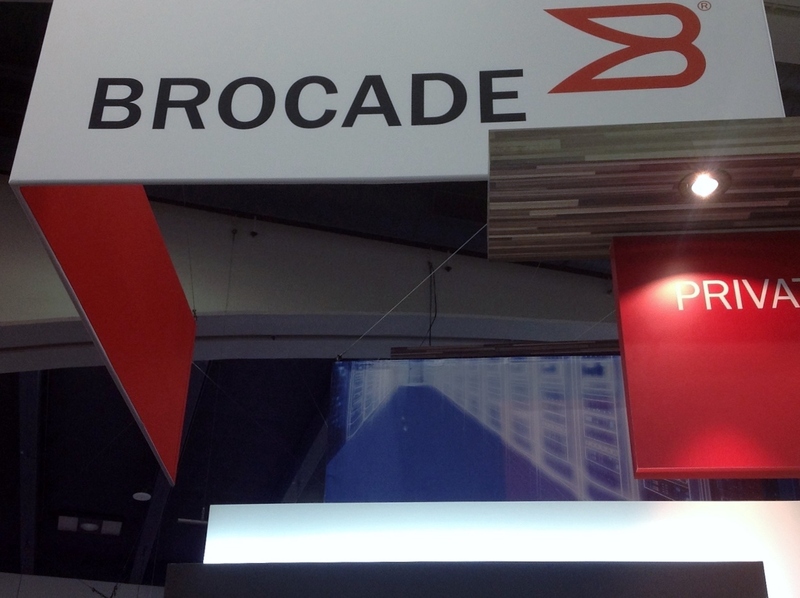 Brocade allows enterprises use networking infrastructure on a subscription basis. Users rent the equipment and can return it anytime. Zadara will also ship hardware to customers on pay-as-you-go terms or you can subscribe to their multi-tenant infrastructure in such a way that the infrastructure used is dedicated and not otherwise shared. As a 4-P marketer I’m always interested in innovative pricing and place-of-sale (delivery) strategies so I’m looking forward to seeing if the hardware rent models work. There were a number of Software Defined Storage and Unified Storage vendors and firms that are betting on a shift from SAN and NAS. Such firms include Cloudfounders, Nutanix, Scality, Simplivity, amongst others. The unified server/storage approach fits well with the development of DIMM-based Flash modules showcased at the recent Flash Memory Summit. Like PCIe Flash drives, the DIMM Flash fits directly into a server (like RAM) taking advantage of available DIMM slots. So with the right software, all the direct attach hard drives across multiple servers can be pooled and managed as a unit while the servers’ Flash is used as a cache for application acceleration. 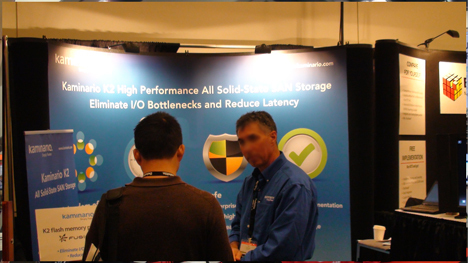 The well known performance issues associated with VDI had all the Flash system vendors and Intelligent Caching products on display. Although most storage systems have some form of caching built in (usually read-only), Pernixdata offers read and write caching at the kernel level for VMs, eliminating latency. VirtunetSystems has a similar VMware enhanced offering. 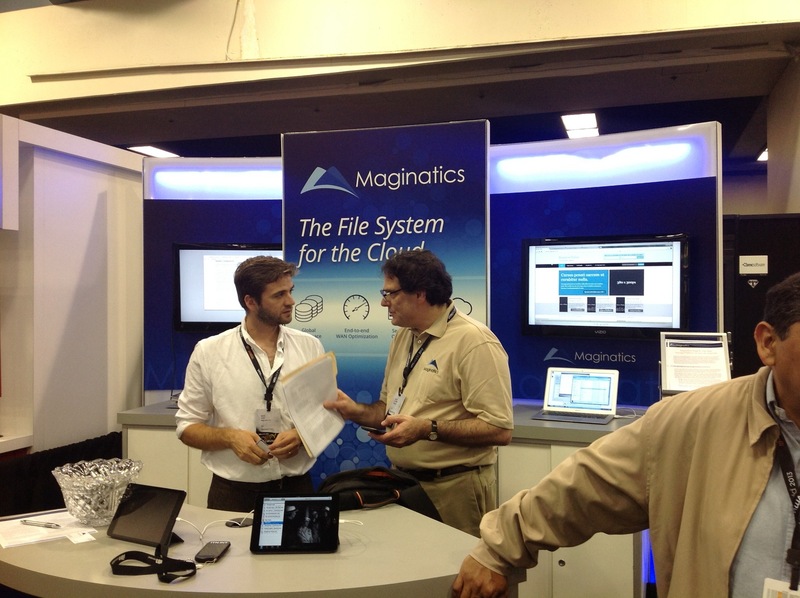 Cloud storage also had a big presence with the most interesting being Maginatics and Nasuni. These firms cache cloud-based data so it works like the data on your local hard disk. Racemi offers cloud to cloud data migration service and charges only for successful migrations. Of course, all the typical storage product categories were represented — everything from innovative JBOD chassis, to backup/recovery/archive software, to RAID and Flash systems. However, I’ll leave the product reviews to the analysts and journalists and move on to other marketing related topics. On the promotion side of things, firms love to make make big announcements at trade shows. 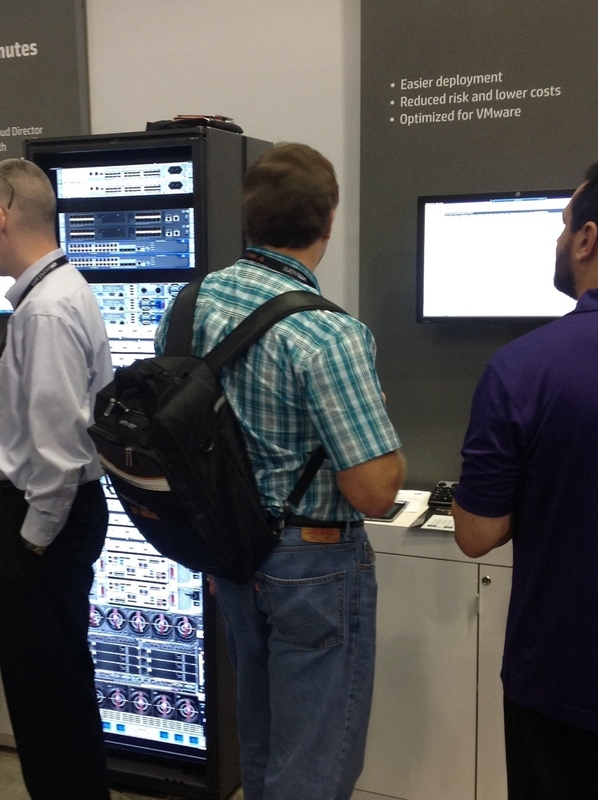 StorageNewsletter reported 33 storage-related announcements for VMworld 2013. I’m not sure why everyone follows this strategy, other than a trade show is a useful milestone that can get the engineering team to release the product. My PR and lead gen. firm, Marketingsage, has looked at the publicity firms achieve with trade show timed announcements. Unless you are a really big firm with a really big announcement, most firms simply get a mention in a roundup that covers everyone’s announcements. However, if you take Marketingsage’s advice and announce either before or after the event, you can get a nice story all to yourself. It’s simple supply and demand. Provide news when it’s scarce and you’ll get better coverage. So what would you do if someone blocked your view and said something to the effect of “move along now, nothing to see here.” Precisely! I stayed. It turned out they are planning a big PR announcement when they add a few more customers and did not want to dilute that announcement. I’ve seen that before. Some marketers call it a “soft launch.” It doesn’t work well. The pundits will know about the product, because they see it at the events (or at a briefing). Like me, they may respect the vendor’s request not to go public (as if a trade show is not public). However, soon the so called news is not news to the people who deliver it to the public, so the eventual announcement fizzles. The soft launch becomes a weak launch. There were two trade show innovations that I think are worth a mention. 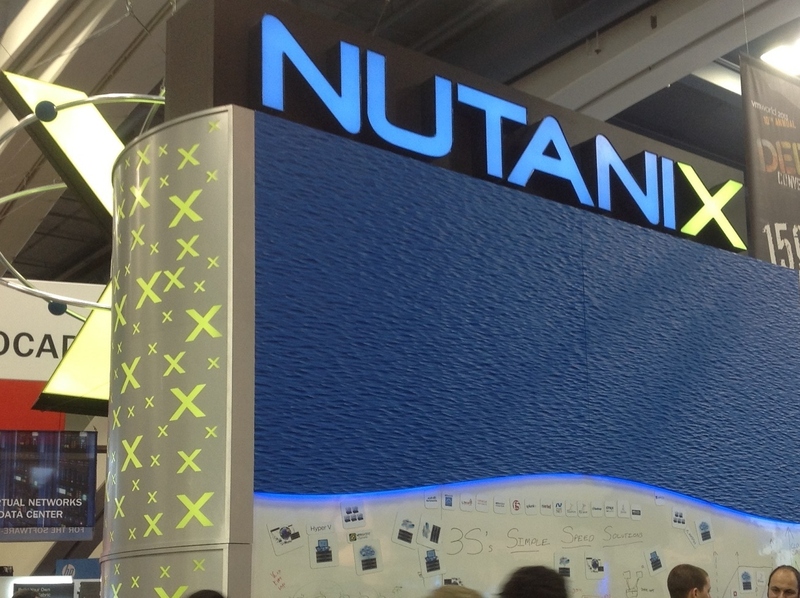 First, there were several booths with whiteboards (see the Nutanix picture above.) A whiteboard is really helpful when discussing a network or a software stack. The second was HP’s lightbox rack. Sure it’s just a picture, but I’ve always questioned the benefit of shipping a ton weight of equipment worth hundreds of thousands of dollars, then having 2 engineers spend hours setting it up for a so called demo that amounts to a bunch of flashing lights. If it’s a canned demo, why not record it, ship the hardware face plates (blinking lights) and replay it on a screen? The “Business Case for SSD” keynote by Jeff Burke, Seagate’s VP of Strategic Marketing, made an impression — not just on me. It was also one of the noteworthy topics being discussed at the lunch tables. Seagate’s presentation amounted to their annual slap-up-side-the-head for the SSD vendors touting the imminent overthrow of hard disk drives — basically everyone in the very large room. 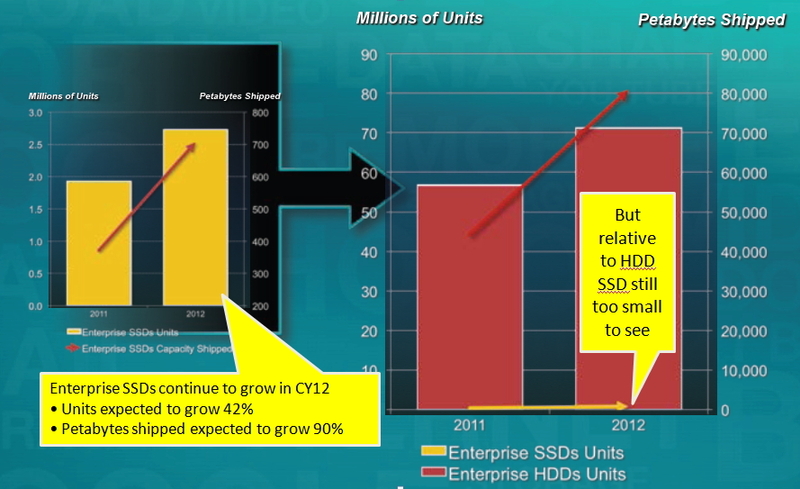 A big chunk of Seagate’s profits come from its high end, higher margin, enterprise HDDs that typically go into arrays. The high-end market is readily moving to SSD because the economics in this performance-centric arena favor Flash over spindles. And, the laptop market is increasingly impacted by Flash-based tablets. Seagate is essentially a vertically integrated manufacturing firm that’s fully invested in HDDs, not necessarily storage (all devices). It faces the Innovator’s Dilemma and may easily become another Kodak if it doesn’t match its lip-service with a big commitment to new technology. Seagate lacks the core Flash technology in an arena where the firms with the core technology may be too big to easily acquire. Building SSD systems causes a conflict with their OEM customers like HP, EMC, Dell, etc. I don’t think anyone will be surprised to see Seagate make a big acquisition as it moves to secure its future. The keynote by Rado Danilak, CEO of Skyera, also stood out with me. 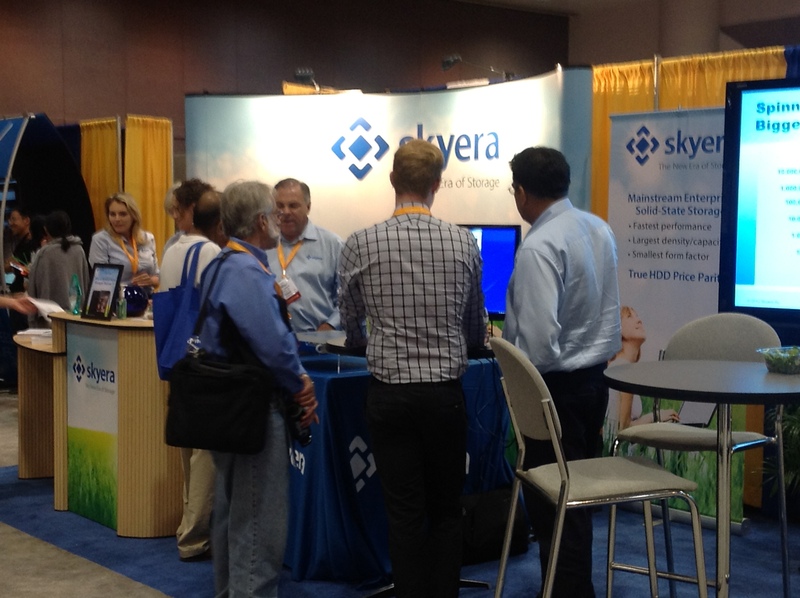 Skyera is a start-up that just announced a box of flash with de-dupe, compression, and technology to extend the life of their MLC chips. The room was packed. However, the presentation turned out to be an overview of some well touted storage and performance issues. Frankly, I thought the presentation was too light for a room full of technically orientated industry insiders. But by the end of day Thursday I had met so many first timers, that I now think the presentation may have hit the mark with this year’s attendees. There are a lot of new people learning about the technology, products and market. Skyera is the shiniest of the new players, but Whiptail came sporting their new look (designed to be more corporate.) The memorable lizard logo was gone. Whiptail also makes a Flash system and uses de-dupe and compression to lower the cost per (stored) gigabyte. I’ve always thought they were smart to focus on solving cloud and virtualization performance problems, rather than marketing boxes of Flash in the face of well established players like Texas Memory Systems and low-cost producers. However, one look at the VMworld lineup shows how crowded the point-solution space has become. Another new firm, Shannon Systems, also exhibited. They are one of many new China-based makers of Flash-based products. Shannon was showing another MLC-based PCIe card. It was good to see these innovative players at the expo, but I’ll bet they met far more industry peers than enterprise customers at this particular summit. This event is better suited to those with an OEM model. Big Data: The ultimate marketing tool? Not so much. This 2012 report by David Rogers and Don Sexton of the Columbia Business School and New York American Marketing Association is not about how to market Big Data products (a topic my firm, Marketingsage, is happy to address). The report is about using Big Data analytics to drive marketing decisions. As the report notes, Big Data analytics is different from “the quarterly omnibus survey panels of traditional market research” that rely on periodically analyzing structured data such as a surveys, click data or sales. Big Data analytics is “predicated on access to frequent and recent data” from many sources. For many this means analyzing data at near-real-time speeds. It also means the combining of data from various digital media — page views, time-on-site, revisits, clicks, opt-ins, opt-outs, purchases, shopping cart abandonment, search engine page ranks, keyword usage, link-backs, demographics, perceptions, tweets, likes, shares, etc. It means combining data from traditional marketing tools such as event sponsorships, print advertising, direct mail, TV and radio adverts with digital tools such as email, social network accounts and mobile adverts/apps. If you are a hands-on marketer, your brain may have just melted down when you thought about what it would actually take to make sense of all that diverse data…even if you had it available to you in real-time. If so, you won’t be surprised to learn that while 91% of senior corporate marketers (at large firms) believe that successful brands use customer data to drive marketing decisions, it’s not happening near as often as some might think. And, if it isn’t happening in the large B2C firms surveyed, it sure isn’t happening in smaller B2B firms with small marketing teams. Not surprisingly, the report notes that marketers who are satisfied with measuring marketing ROI tend to use more metrics than organizations that are less satisfied. Additionally, their leaders set measurable objectives for marketing actions. Accordingly, the authors go on to recommend that marketers should get started with the basics of determining marketing ROI and then move on to ROI best practices. Although it’s a long way in the future (maybe a decade), I’m looking forward to the day when a marketer can look at a dashboard that reveals what’s going on everywhere, in real-time, especially if coupled with artificial intelligence that offers some insights into the data. However, lets not forget that such a dashboard is no different from the one in your car. You still have to do the driving. Even with a navigation system that gives you step-by-step instructions you still need to decide where you want to go and avoid all the obstacles along the way. In reality, the data is only helpful if you define it appropriately, understand where it’s coming from, know what’s driving it and how to act upon it to meet your goals. That’s not a given. I’ve seen many instances where firms analyze marketing data only to draw poor and very costly conclusions because they lack perspective and experience. The good people ay Sys-Con Events invited me to the Cloud Computing Conference & Expo. The event was held November 7 through 10, 2011 at the Santa Clara Convention Center in Northern California—one of my favorite venues. I was there on days 2 and 4 of this 4 day event. Reportedly there were over 7,000 attendees that included CIOs, CTOs, directors of infrastructure, VPs of technology, IT directors and managers, network and storage managers, network engineers, enterprise architects, and communications and networking specialists. As usual, I viewed the event through the eyes of a marketer responsible for data storage and data management products. My firm, Marketingsage, helps clients generate sales leads, build brands, launch new products, and establish new sales channels so trade shows are important, especially for lead generation. There were 4 days worth of speaking sessions, mostly presented by vendors. The general sessions that I attended all seemed to have large audiences, although the huge room was not full. There were also 7 special interest tracks with one dedicated to those interested in Cloud Storage Virtualization APIs. Another was dedicated to Cloud Architecture, Security and Performance. The expo was small enough to ensure that every attendee could see every booth over the course of 4 days. 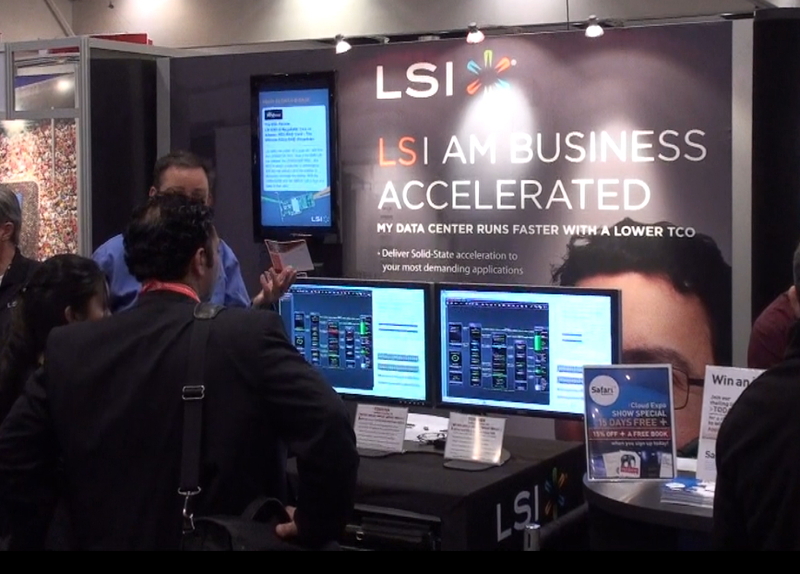 There were about 100 exhibitors including VMware, McAfee, Oracle, and IBM. The vast majority of booths were small 8′ or 10′ popups and they were packed pretty tightly. So on day 2 the aisles were crowded. However, by day 4 the aisles were really empty and the exhibitors were not busy at all. The crowds at the general presentations also thinned substantially, suggesting that the event may be enhanced by cutting it from 4 days to 3 days. Is Cloud Expo a Good Show for Marketing Storage products? Is Cloud Expo a good show for marketing storage products? The answer depends on what type of storage product you are marketing. This show has 3 types of storage vendor: (1) hosted storage, (2) storage related software and (3) storage hardware. The audience favored those selling hosted storage/servers and storage management/monitoring software. Hosting firms included Amazon Web Services, Rackspace Hosting, SoftLayer, GoGrid, Virtustream, FireHost, and Zadara Storage, and PhoenixNAP to name but a few. Storage/data management/monitoring vendors included Abiquo, StorageCraft, Amplidata, MicroStrategy and Nimsoft, again to name but a few. Storage infrastructure/hardware vendors did not flock to this event even though many tout their products for virtualized and cloud environments. 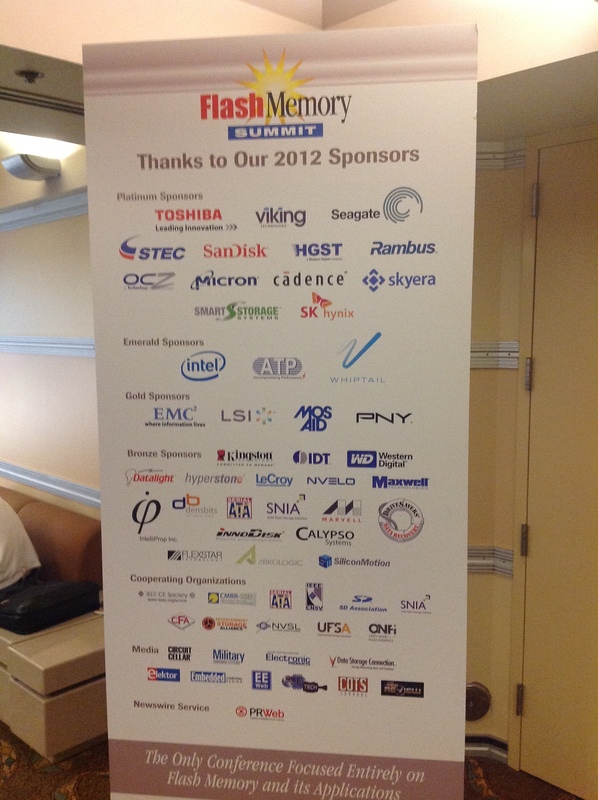 I saw prominent solid state disk (SSD) vendor Fusion-io on an early exhibitor list, but they were not there. 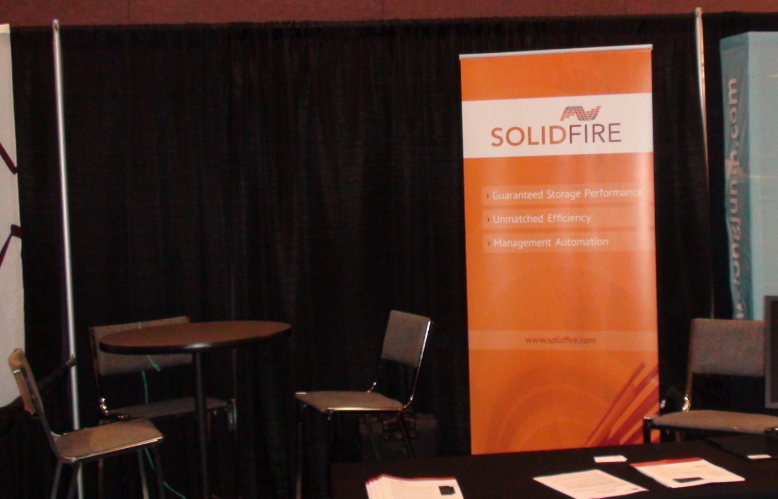 Storage infrastructure exhibitors included solid state disk vendors SolidFire and LSI. 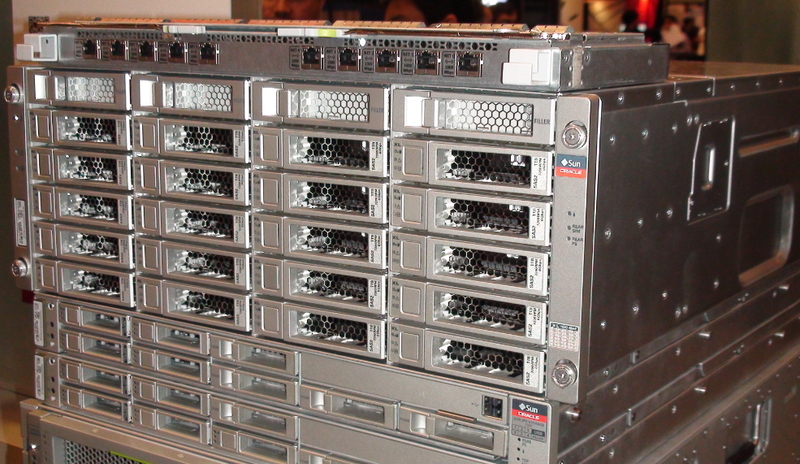 Oracle also had a hard disk array on display. There were a few other hardware exhibitors that had storage components, but I wouldn’t classify them as storage infrastructure vendors. Morphlabs mCloud uses Dell servers, Arista Network switches and Nexenta’s storage manager. Each blade has its own 3.5 inch HDDs. I asked several exhibitors whether they were happy with the Cloud Expo event. All said there were happy and would likely attend again next year. That’s a ringing endorsement, but I’m going to discount it a bit for the hardware infrastructure vendors by noting some factors important to me as a sales-centric marketer whose budget would be on the line. The endorsers were not salespeople or MarCom people. They were product manager types so their expectations may be different to mine. Most were local to the area so they did not have to leave home to participate. Several commented about a high ratio of vendors to customers visiting their booth. And one commented that most visitors were not really storage infrastructure decision makers. However they were valued as potential influencers of such decisions. 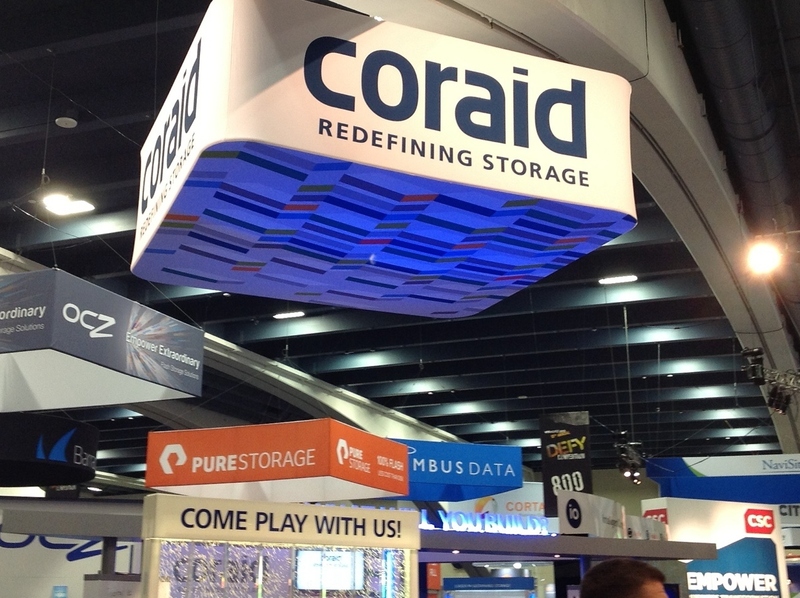 So is Cloud Expo a good show for marketing storage products? Yes, if your target decision makers are focused on the cloud or virtualization application layer. I’m not ready to make a case for storage hardware vendors. 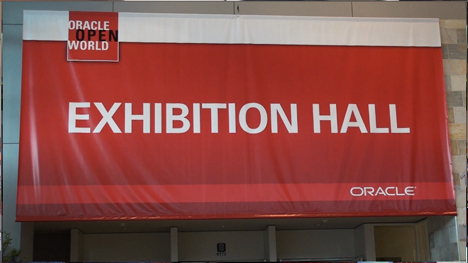 I go to Oracle OpenWorld (OOW) in San Francisco every year because my PR and lead gen. firm, Marketingsage, helps data storage and data management firms market to the large enterprises that use Oracle. 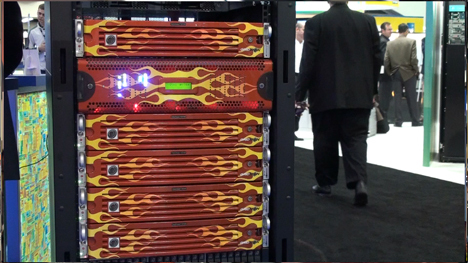 Wednesday Oct. 5 was my day to visit the 2011 expo and this post takes a marketer’s look at the exhibits of some of the most innovative firms who were showing off their high performance storage hardware at the show. This was the last day of the expo so you might expect it to be somewhat quiet. In my opinion is was far too quiet at any booth that was not front and center in the main hall or giving way a car, iPad, iPhone 5 4S. 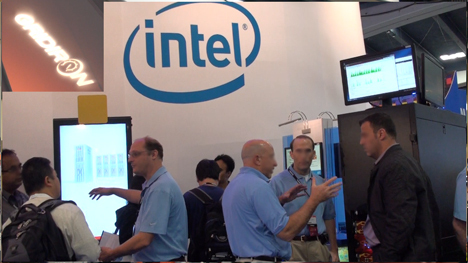 While that may be bad for exhibitors, it was good me because I got to see most of the high performance storage players. Besides the big guys like Oracle, EMC, HP and Dell, there were more start-up firms this year. Most of them paid big bucks for big booths. 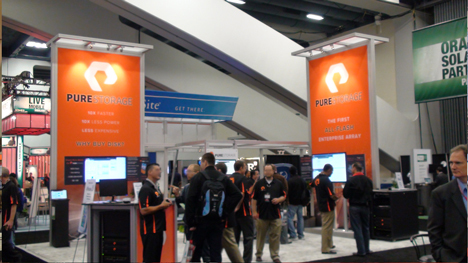 Start-up, Pure Storage had a big bright booth and lots of people wearing their distinctive shirts. They also scored a visible spot in the Samsung booth. Their solid state disk is special because it uses real-time deduplication and compression to reduce the amount of data that’s actually stored on more expensive SSD. Therefore, they claim the cost of their system (when available) will be lower than purchasing hard disk drive-based systems for the same volume of data. 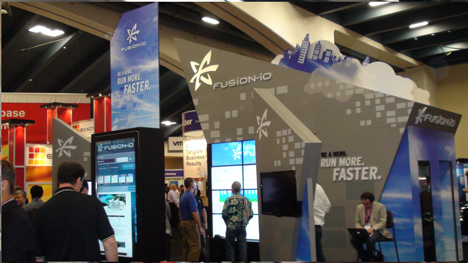 Fusion-io had the most visually impressive information walls backed by a mini data center. They also had some pro-active salespeople willing to grab passersby. I can respect that. Fusion was touting “a tier on a PCIe card” and they are getting some impressive Flash capacities on relatively small cards. The other vendors went out of their way to point out that this PCIe-based storage is not shareable. 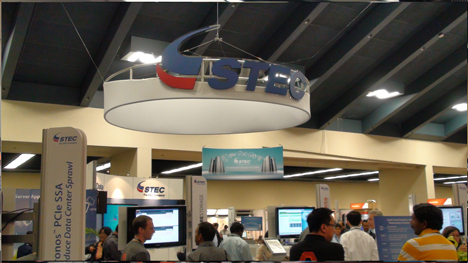 STEC had a front row booth in the corner of the main hall. They had a small theater where they did a good job introducing their rather large Kronos PCIe card. They subsequently gave out t-shirts to those who filled in their sales lead survey. Customers can use a single STEC Flash drive to replace a hard drive in a server or they can array them for rack mounted enterprise environments. Violin Memory also stumped for a big front row booth. Interestingly they only used half of the booth for meeting attendees. The other half was hidden and off-limits. 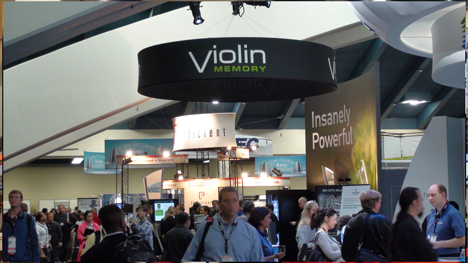 Violin prefers to call its SAN-attached SSDs “memory arrays” and they see them as primary storage to be used in an “all silicon data center” without hard disk drives. Meanwhile, Quantum was at the back of the same hall proving that tape is still an important part of today’s data centers. 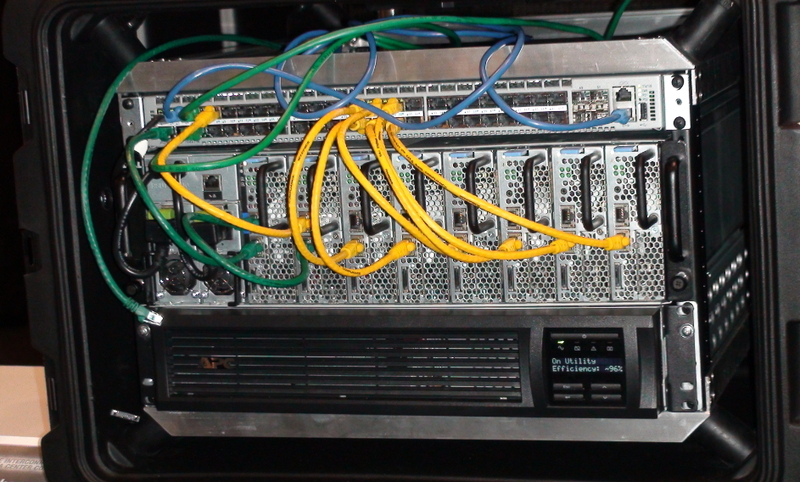 I was impressed by Quantum’s high performance StorNext system. It’s used to quickly ingest and provide shared access to REALLY BIG files, like satellite and geology images, and manages all of the storage complexity of managing and archiving to hard disk or tape. 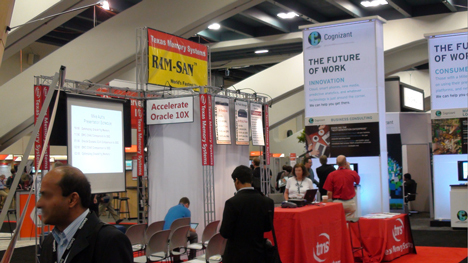 Our friends at TMS exhibited their SSDs at OOW years before some of the other SSD firms even existed. They had their usual spot in the middle of the main hall. And as usual, you could be standing next to the booth and not notice it. However, Oracle users seek them out. TMS had a small theater where their genuine Oracle Guru talked to Oracle users and developers about how to accelerate Oracle. TMS does not confuse OOW with SNW (Storage Networking World) and their no frill SSDs are always fast. I went all the way across the road to see Kaminario in the lower traffic West hall. They had a small 10×10 pop-up booth, but they were getting their share of visitors. 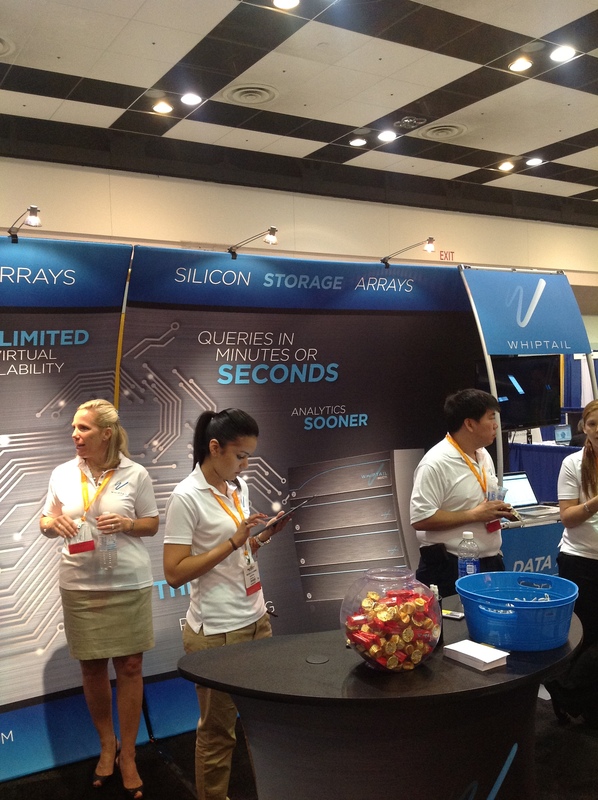 They probably deserve the runner-up prize for the biggest-bang-for-the-buck booth among SSD vendors. Kaminaro’s SAN-attached SSD lets customers choose DRAM and/or Fision-io’s Flash memory. 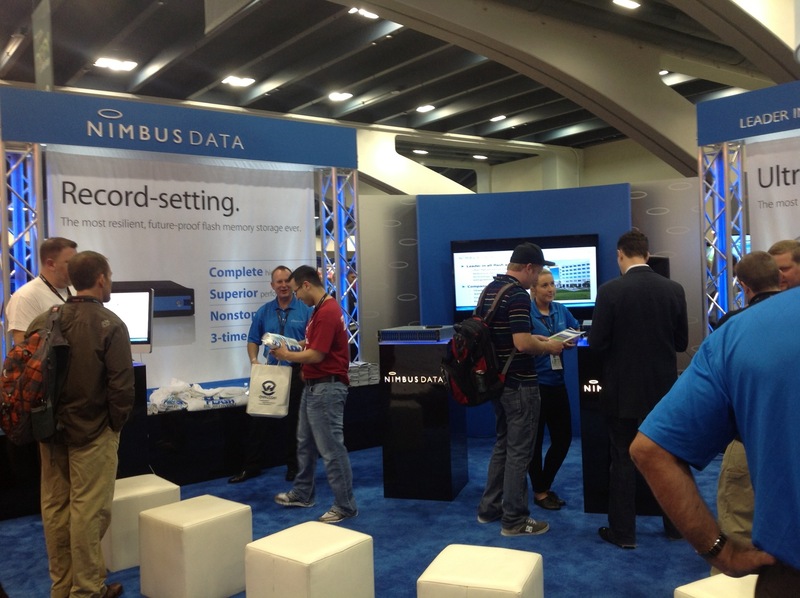 Nimbus Data Systems was at the show as well, but their small booth looked like a parking space. It was 80% sports car, 20% SSD. No, you could not win the car. I was laughingly told by another vendor you could win the privilege of sitting in it for a while. We would have liked to seen WhipTail, SolidFire, Nimble Storage and some of the other serious vendors of high performance enterprise storage systems. Alas, they were not at this particular show. David X. Lamont is an accomplished marketer of IT products and a partner at Marketingsage, a PR and lead generation firm that specializes in marketing data storage, data management and enterprise software products. He can be reached by email at blog [at] marketingsage.net. Fellow marketers and IT professionals are invited to join his network on LinkedIn and to subscribe to this blog (see sidebar). I had the opportunity to join The American Association of Inside Sales Professionals (“AA-ISP”) and attend their Inside Sales Conference on February 10th 2011 at the Hyatt Regency near San Francisco Airport. The conference is dedicated exclusively to the “front lines” of Inside Sales, it brings together Inside Sales Professionals to learn, share, and network. It was a very well attended conference with good presentations and good participation. There was also a small expo featuring some very innovative tools from firms like EchoQuote (see review), InsideView (prospect profiles from social media), Glance (online meeting screen sharing) and ConnectAndSell (they pre-dial and connect prospects in real-time to your salespeople) to name just a few. What impressed me about the AA-ISP crowd was their professionalism. This conference, and the people who attended, were all about solving problems and improving sales techniques. There was no politicking about quotas, inbound sales leads, marketing support, or other matters that you might experience at a company meeting. If there was an overt area of dissatisfaction with management and other departments it related to how inside sales professionals are viewed and compensated. Despite achieving similar quotas to outside salespeople, inside salespeople are often paid less and given less respect. There is a tendency to think of every telephone-centric salesperson as telemarketers reading from a script. Smart organizations have professional salespeople who spend most of their time reaching out to prospects and customers using the Internet and telephone, rather than traveling. These Inside Sales Professionals are not junior salespeople, nor script-bound telemarketers. They use CRM software, databases, LinkedIn, Facebook and other tools to prospect. They communicate by email, Skype, GoToMeeting, video presentations, online demonstrations, and the telephone, as well as an occasional face-to-face meeting. Their productivity can be so high that it makes the idea of carrying a bag with a day planner, brochures and business cards seems totally antiquated. The bigger the deal, the more time you should spend on research. $100K+…spend half your day. $10K… spend 10% of your day. Prepare before you call. Take 3 minutes to identify 3 topics to talk about. Call first. Then email. This distinguishes your email from automated email. Caller ID impacts your contact rates. A local ID is best and can be up to 400% better than a blocked ID. Regular area codes are better than toll-free numbers. Persistence works. That means 6 to 8 call attempts. Calling between 8 to 9 am and 4 to 5 pm can increase connect rates by 15%. Wednesdays and Thursdays are better than Mondays. Consider this when scheduling meetings, research, and other sales-support activities. A good voice mail message will result in a call back 5 to 7% of the time. Leave voice mail every 2 days. Fax contact rates are 7X better than email. Mail lists go stale. Expect 3 to 5% of emails to go bad every month. People leave, firms close. Who should attend? If you run a US-based sales department you should definitely attend an AA-ISP Conference. If you are an upwardly mobile sales professional you’ll want to attend. Is the Inside Sales Conference for marketers? Not really. But if you don’t have to travel far, or pay much to attend, it’s worth a day of your time to sit in, listen and network with sales professionals from other industries. As a marketer of IT products I learned something valuable about sales lead management strategy, especially how “best practice” salespeople work large volumes of unfiltered leads. As a result, Marketingsage has made small, but valuable changes to the best-practice process that we recommend to our clients. We’ll eventually put out a video on that topic so if you want to learn more without becoming a client, join the email notification list for this blog. Logoed polo shirts are the de facto uniform at most IT events so it’s useful to have a convenient source that allows you to outfit the sales and marketing team at a reasonable price. A typical trade show requires 10 or so new shirts of different sizes for those on booth duty so it’s not always practical to order in bulk. Queensboro is based in Wilmington, NC and supplies logoed apparel such as shirts, hats, etc. There are plenty of similar suppliers but I decided to try Queensboro in April 2011 because Marketingsage manages trade show logistics for clients so we source booth uniforms and giveaways. Queensboro offered a good selection, low minimum volumes, reasonable prices and a convenient internet-based service. Additionally, they had a $2.95 trial offer for a polo shirt that included the logo, setup and shipping. That represented an almost free sample. Samples are important because a Chinese definition of XL may not be the same as my US definition. Additionally, each logo is unique and you don’t know how the embroidery will turn out until you see it. Ordering the polo shirt on the Queensboro web site was relatively easy. I choose a navy colored polo and uploaded the Marketingsage logo. I was immediately concerned about color contrast because the logo uses a navy blue. I noted that concern in a comments box although I noted that Queensboro allowed you to select thread colors as part of the review process. A few days later I was able to review a “sample” logo on their web site. It was a simulation of what the logo should look like when embroidered. Frankly, it did not look very good, but a note reassured me that the embroidery usually looks better in real life. I requested a smaller logo and changed the thread colors to white (or at least I thought I did). The shirt arrived about a week after I approved the design. I was disappointed. The threads were not all white. The “marketing” portion was a navy on navy (the picture below is brighter than real life.) I also did not like the “resolution” of the embroidery, but I could accept some blame for that if it was the result of my request for a smaller logo. The quality of the shirt itself appeared good and the XL size was generous. I could never use the shirt at a trade show, but that’s the whole point of getting a sample. You want to know about any problems in advance so you can fix them. Here’s where Queensboro fails. I used the Queensboro system to ask about the thread color on my order. It’s possible I did not save the selection on the web page (although part of logo was white, as requested). I would have accepted some push back if that was the case. I never got a response. The satisfaction survey form arrived and again I noted the issue. No response. Queensboro’s customer support operation (if any) let them down by not responding at all… even to tell me that the issue was my fault or to point me to a new order form. A side note: Queensboro’s automated email starts once you place your order. I think I got a promotional offer every day or so. I did expect email, but that’s way too many for me. I stopped opening them. I didn’t immediately unsubscribe because my order was pending. When I eventually unsubscribed I noticed an option to slow down the email, but at that point we were done. If you decide to try Queensboro I’d suggest uploading a logo that uses the colors you want for each order. Editing artwork mitigates the convenience factor, but you can’t assume the thread color selection process will work for you. I’d also suggest using the logo size they suggest (or larger). As always, remember that embroidery does not work well for small logo elements such a serifs, thin lines, and overlapping colors. David X. Lamont is an accomplished marketer of IT products and a partner at Marketingsage, a PR and lead generation firm that specializes marketing data storage, data management and enterprise software products. He can be reached by email at blog [at] marketingsage.net. Fellow marketers and IT professionals are invited to join his network on LinkedIn and to subscribe to this blog (see sidebar). EchoQuote is an online lead generation and lead capture system. EchoQuote customers list their products within the system and refer web visitors to a dedicated URL. The visitor (user) can then register to get a self-service price quote. It’s a straightforward process. Users enter their contact information and select the product(s) they want from your exclusive list. You (the vendor) have the option to automatically approve all price requests or to approve/deny individual requests as they come in. Upon your approval a personalized quote (pdf format) is sent to the requester by the EchoQuote system. Leads are delivered to you by spreadsheet, email, and in some cases by direct injection into your CRM system. It’s worth noting that EchoQuote is not a quote configuration tool where a user requests various options and add-ons before a price is calculated. Each item listed uses your predetermined configuration and price. Why would a storage vendor want to use EchoQuote? Any serious consideration of your products requires a price so your best prospects will seek one out. A prospect has several options. They could contact your sales team for a quote. They could contact another vendor, such as a reseller. Or they could search for a price on the Internet. If you would like to know who is interested in your products and prices so you can influence the sale, then you’ll be hoping that the prospect contacts the sales team. You may even offer a request for price quote (RFQ) form on your web site. Unfortunately, most early-stage prospects won’t contact your sales team simply because their initial need for pricing is to ballpark the solution for general budgetary purposes. They are not ready to deal with a pushy salesperson, nor have they considered all their alternatives. Because they do not contact you, or use your in-house RFQ form (which they expect will go straight to a salesperson), your sales and marketing teams lose the opportunity to identify and influence serious prospects at a critical decision point. If a prospect does not want to initiate contact with your salesperson, a 3rd party self-service system like EchoQuote is an attractive option. Frankly, I expect most users of EchoQuote do expect a follow-up from a salesperson, but that follow-up is after a budgetary price has been delivered. The prospect got what they needed without all the qualifying questions and implied commitments that come with contacting a salesperson. What do I like about EchoQuote? My lead generation agency, Marketingsage, has worked with the system for several years and I’ve seen it deliver high-quality sales leads for storage products that are not otherwise captured by in-house RFQ forms or inbound calls to a client’s sales team. The online EchoQuote system is relatively easy to work with and the vendor gets to approve or deny price requests. EchoQuote’s pay-per-lead pricing is reasonable and performance-based. Very low volume leads cost just $50 each. Higher volumes will be priced lower and EchoQuote caps the monthly amount you’ll have to pay. Of course, you can request a self-service quote for the EchoQuote service. They also offer a free trial. Last, but not least, Dale Underwood, EchoQuote’s CEO, is a veteran of the data storage industry and is attuned to the pricing methodologies used within our industry. What don’t I like about EchoQuote? I don’t have any real dislikes, but I’ll highlight some consideration points. If you have your own RFQ form, you can expect some cannibalization so you might end up paying for some leads that would otherwise be free. However, I’ve observed situations where 7 out of every 10 prospects who request a quote choose the 3rd party self-service option over the in-house option. Most marketers will find that to be a reasonable tradeoff. Additionally, some prospects will choose your in-house RFQ form over the EchoQuote option. These leads tend to be very hot because they expect to engage with a salesperson. It’s useful to have, and to recognize, leads from both types of form. Occasionally a user prefers to generate separate price quotes for each product they have an interest in, rather than a single quote with all the products. When that happens, you really only have one prospect, but you pay for several leads. However, that’s typical of most pay-per-lead systems and it may not be an issue at all if you are reaching your monthly price cap. Are the sales leads any good? If you believe, as I do, that a price request is better than an information request (e.g. a white paper download) then the leads you get through EchoQuote are highly desirable. After all, a price requests indicates that a critical go/no-go decision is being made. An information request may just indicate curiosity. You can learn more about lead grading from this Marketingsage white paper “Defining and Ranking Sales Leads” (pdf). You’ll get the best results from EchoQuote when it’s offered as a registration option in your promotions. A self-service price quote is an attractive call-to-action in a promotion, but EchoQuote itself is not the source of your leads. It is a vehicle by which some leads are captured and delivered to you. If you don’t invest in promoting your product, don’t expect many sales leads, regardless of how you capture them.